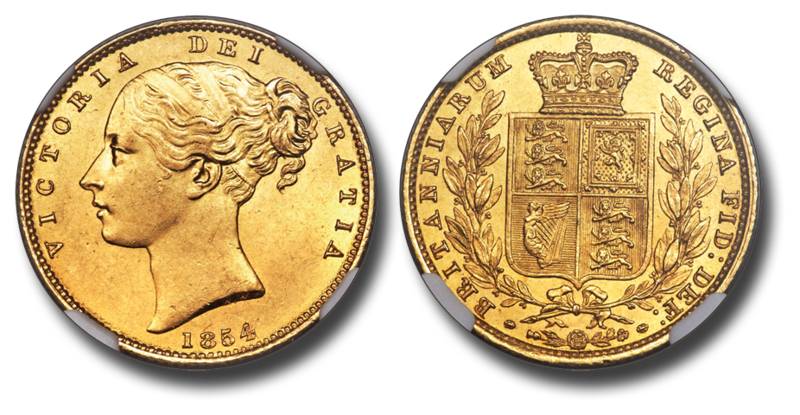 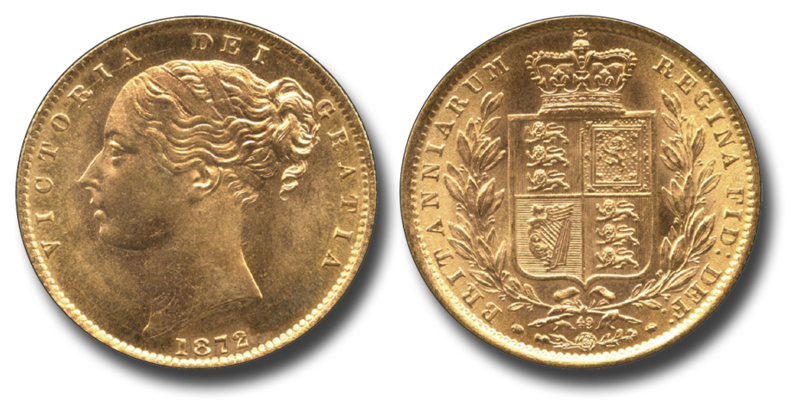 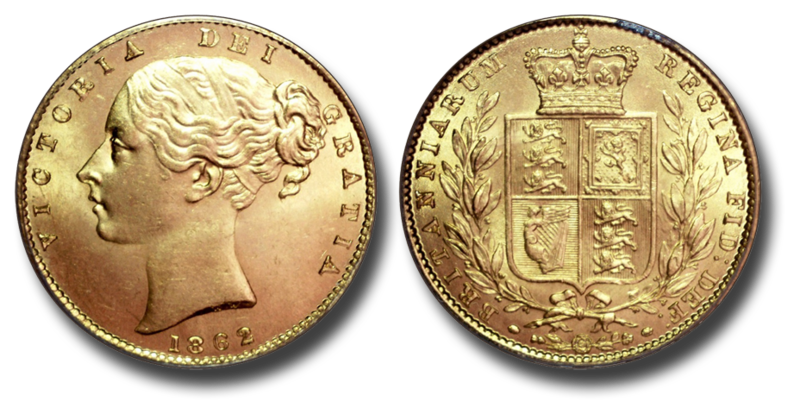 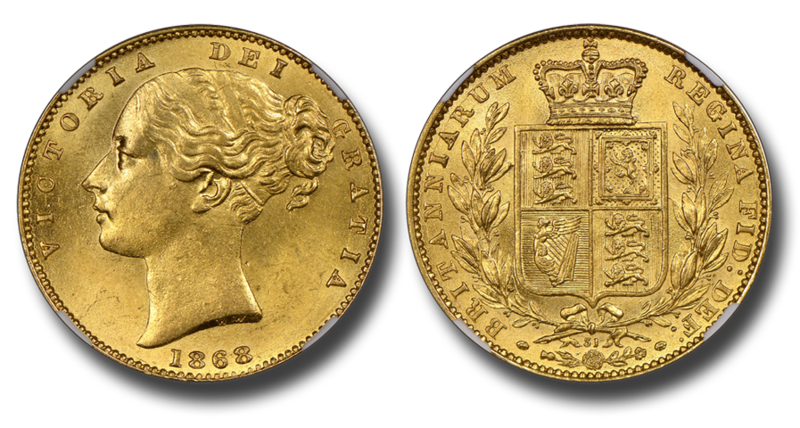 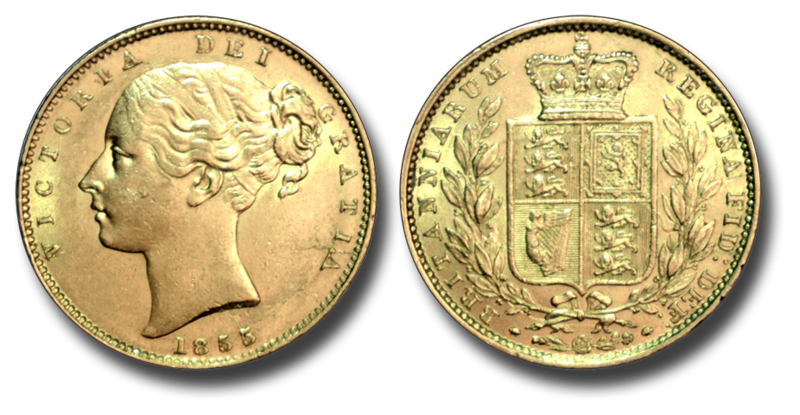 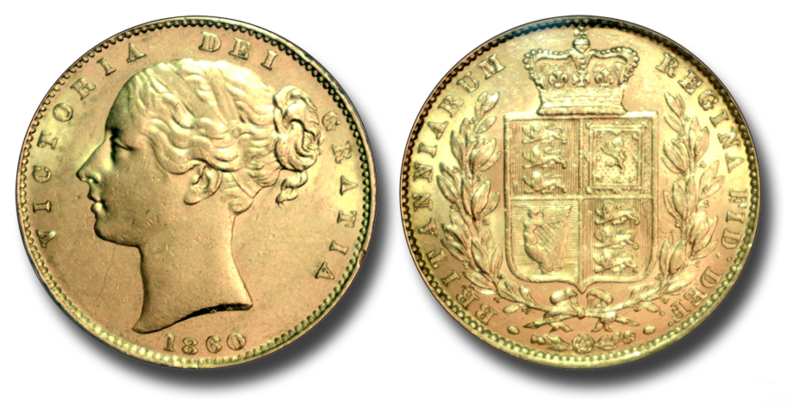 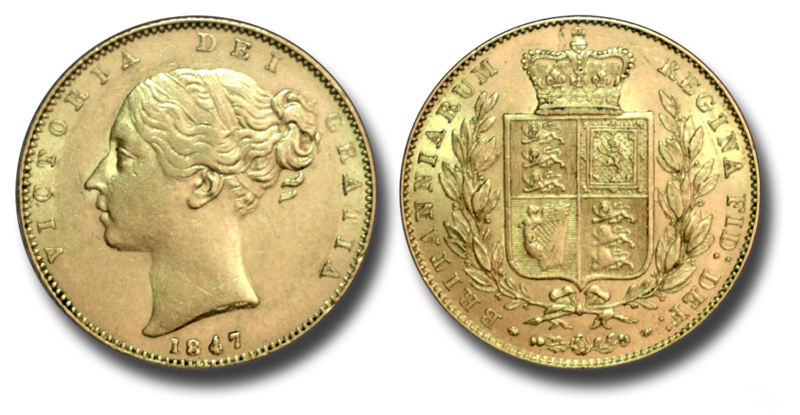 Shield sovereigns are gold sovereigns bearing the bust of the young Queen Victoria designed by William Wyon on the obverse and a crowned royal shield on the reverse. 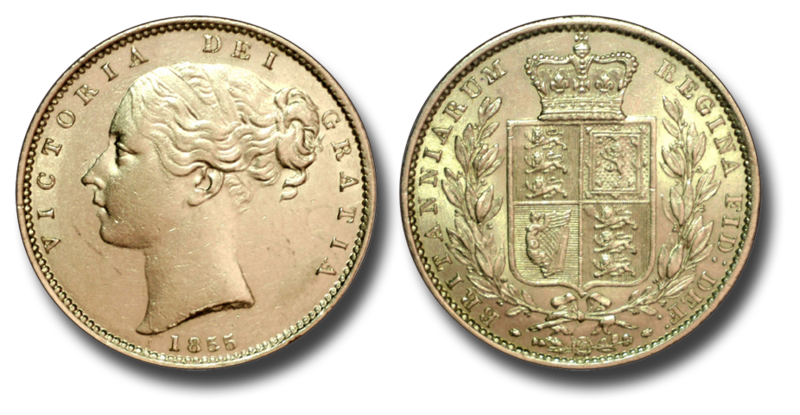 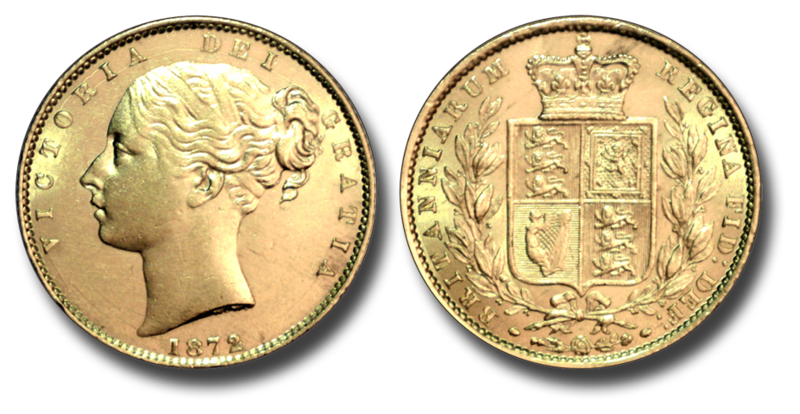 They were primarily minted in London from her coronation in 1838 until 1874, with the exception of the years 1840 and 1867. 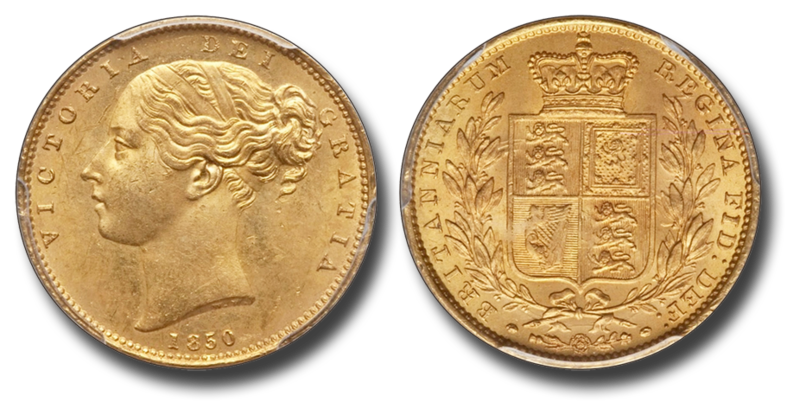 Each sovereign is 22.05 mm in diameter and 1.52 mm thick, weighs 7.9881 grams (ideally), and has a purity of 0.917 percent (22 carats), yielding a net pure gold content of 7.3224 grams (0.2354 troy ounces). 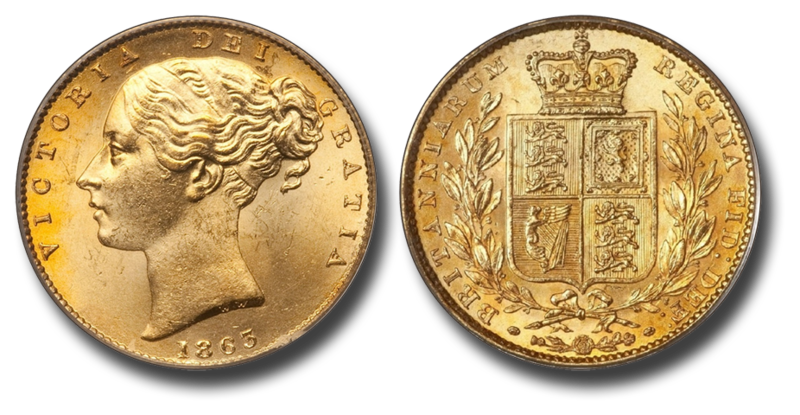 The objective of this collection was to obtain a sovereign from each circulation year of issue from the London mint in extremely fine or better condition. 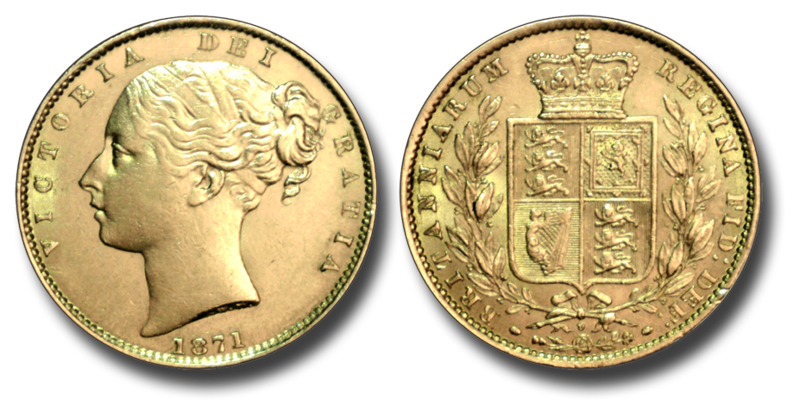 An example of every year has been acquired, so the objective is met; however, there are varieties in some years that are not represented. 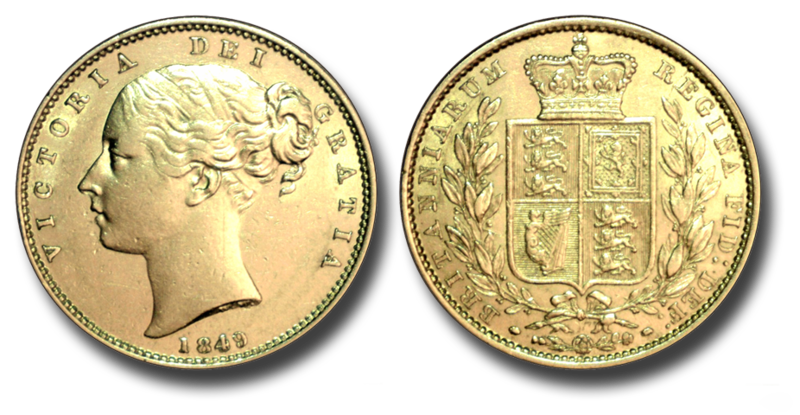 All are in Extremely Fine or better condition; most are Almost Uncirculated, and twenty-three are in Mint State. 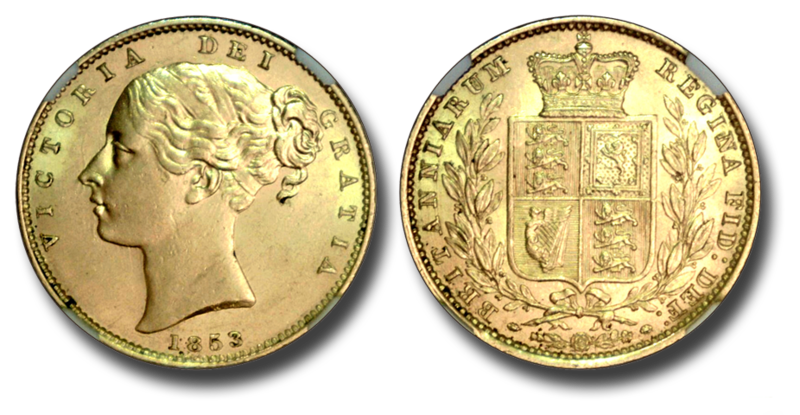 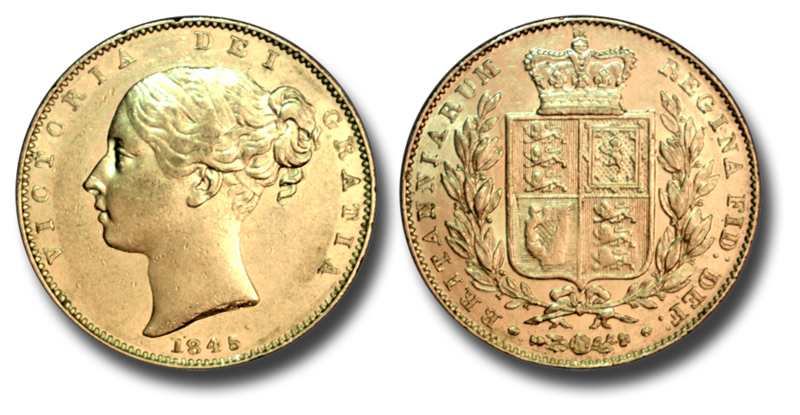 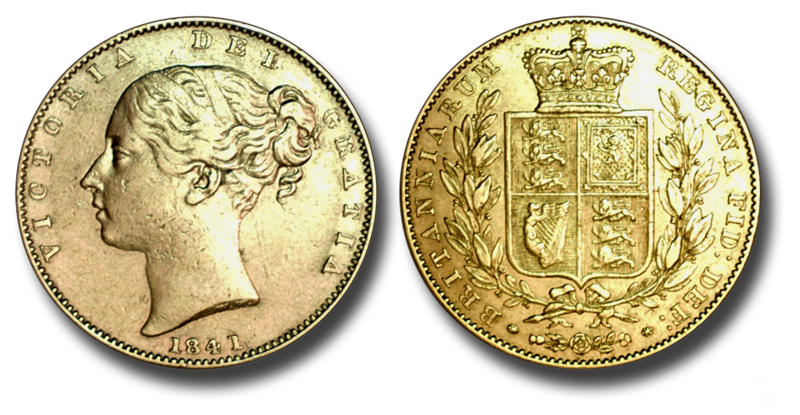 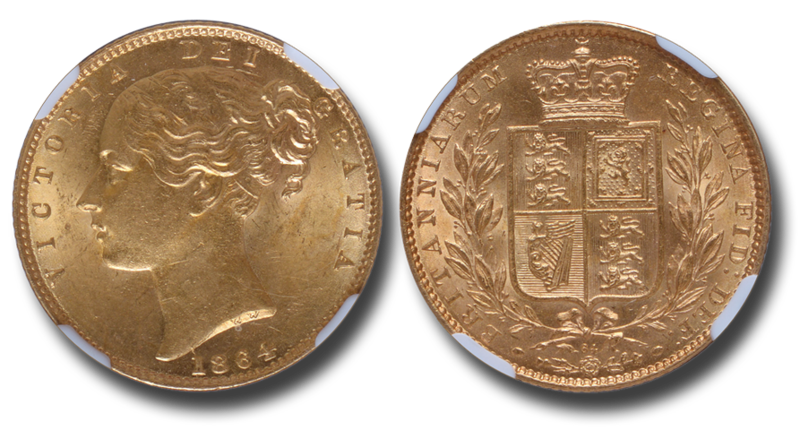 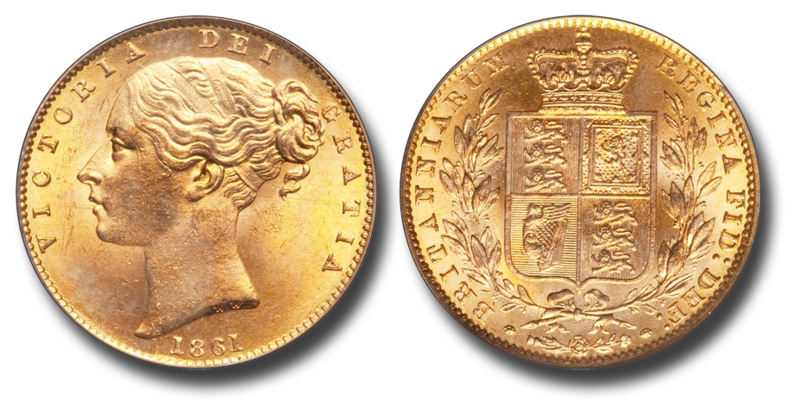 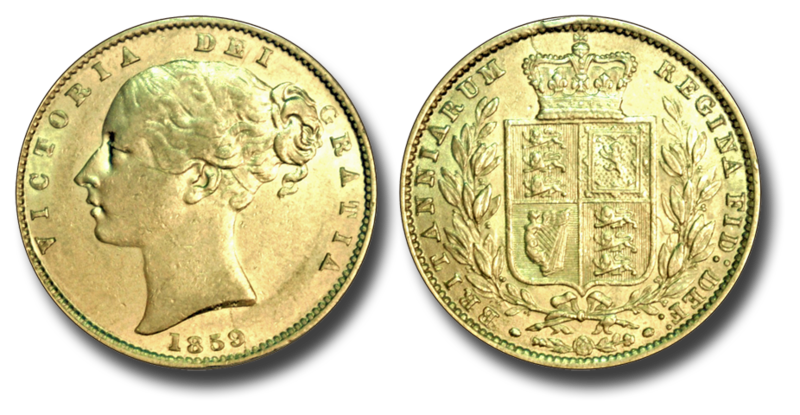 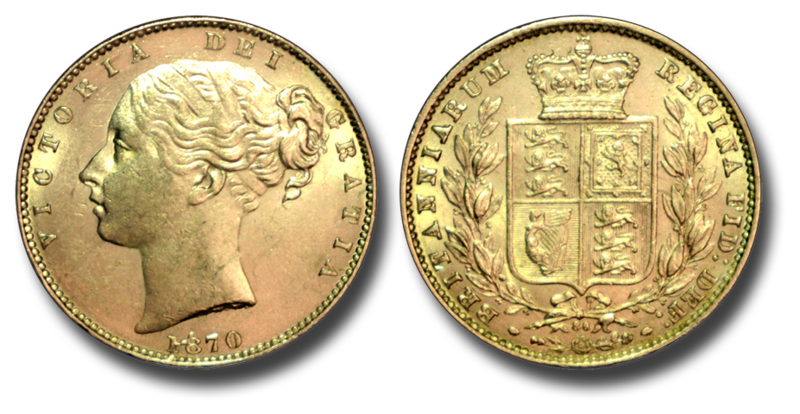 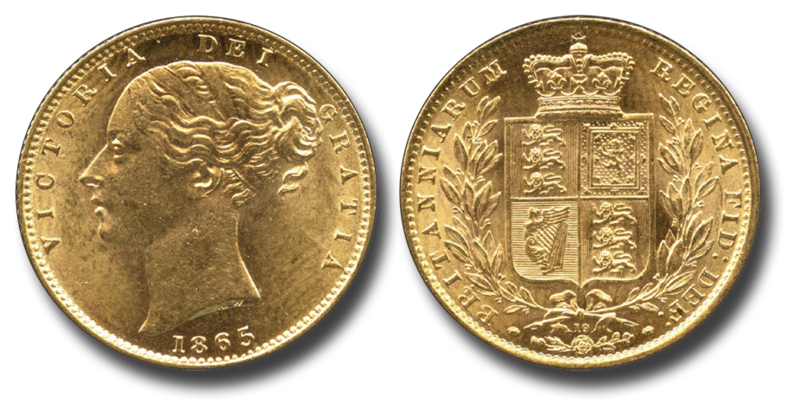 The 1859 “Ansell” Sovereign is the finest known to exist. 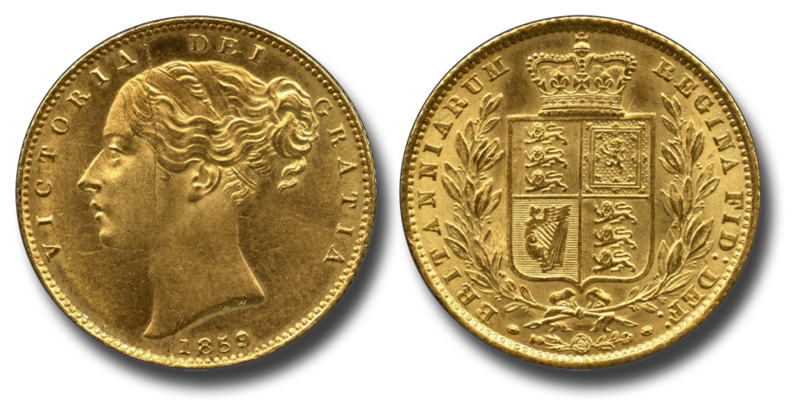 The collection is not stored at the owner’s residence. 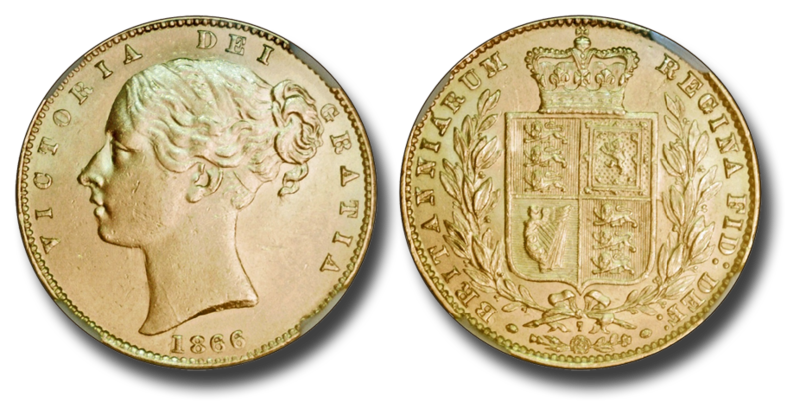 The coin images were created from photos by the author, with exceptions as noted. 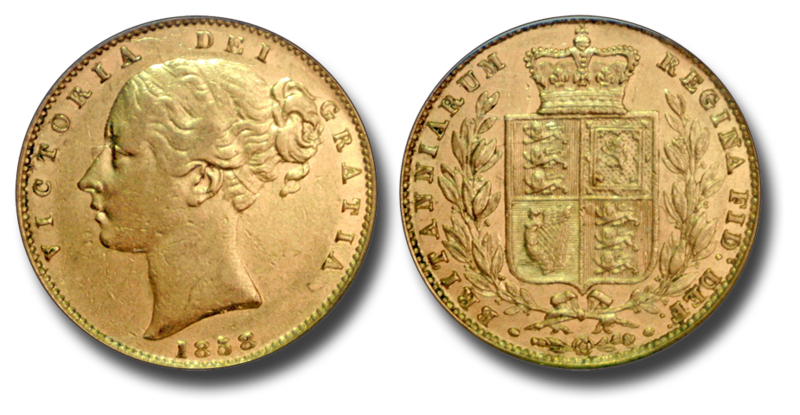 Reference numbers are from Spink. 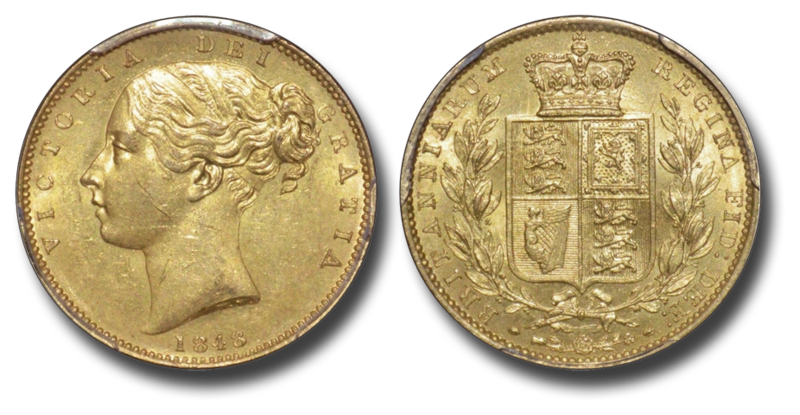 Estimates of rarity are from Marsh. 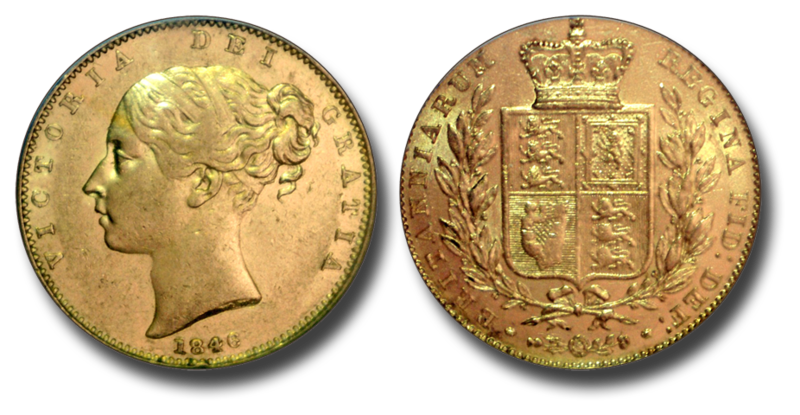 Estimates of condition are from NGC, PCGS, or the author as noted. 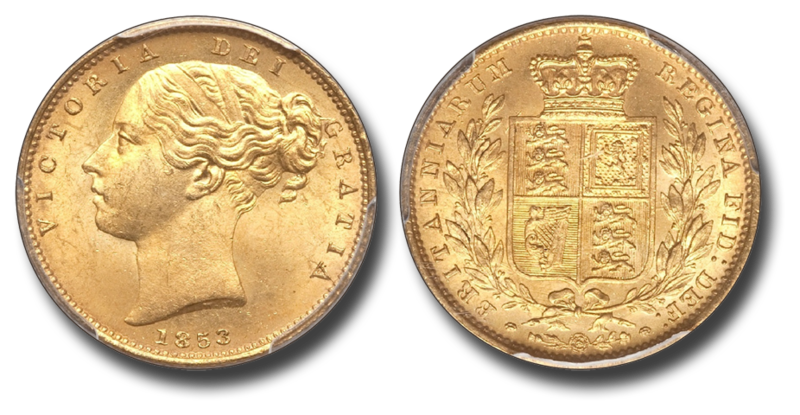 “Sovereigns from the shield series … are, I feel, the most attractive of Victoria’s reign; they will present the collector with a great deal of difficulty especially if he wants to acquire them in top condition; even many coins rated as common or normal will still fall into this category. 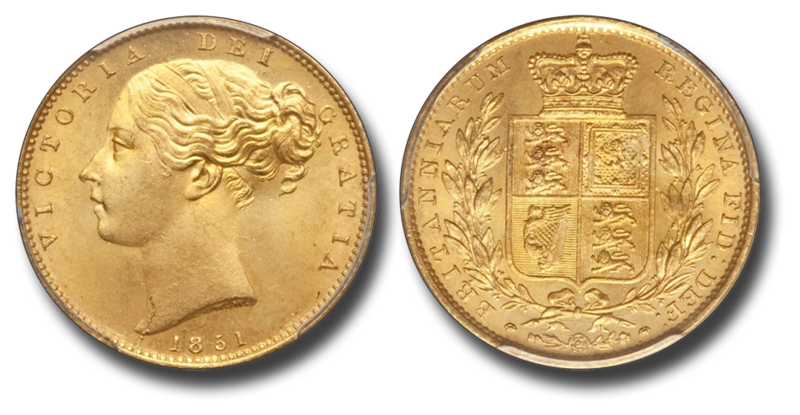 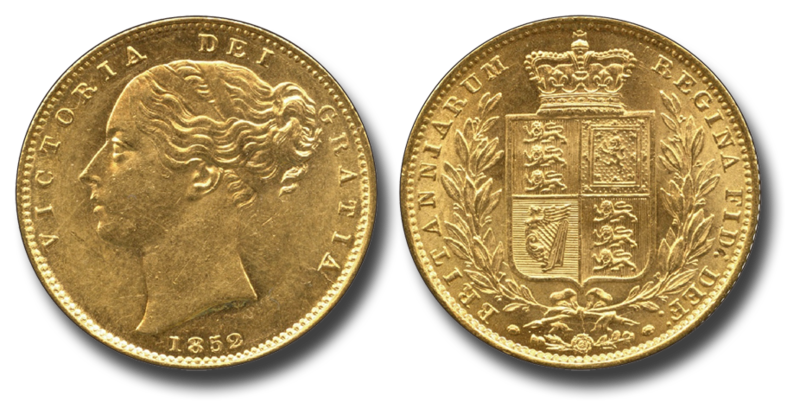 There are two important factors that contribute greatly to the difficulty I have mentioned, and one is that during Victoria’s reign the sovereign was used very much for trading purposes, and being made of such soft gold, it took only a short period of time for wear to become very evident. 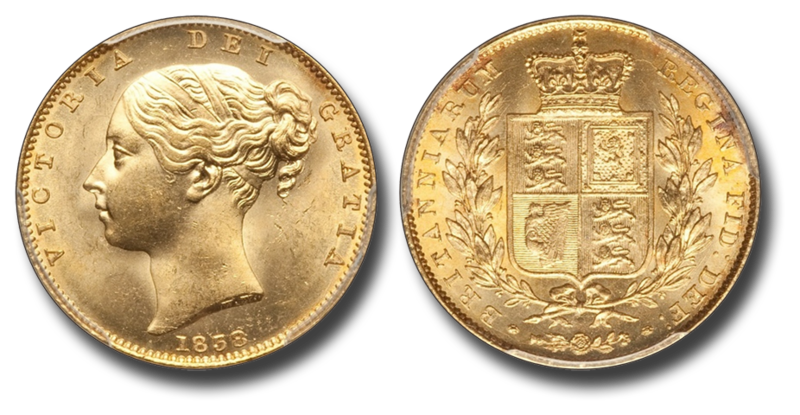 The other big factor was the very large recoinage that took place between 1842 and 1845 when more than £14,000,000 of light gold was withdrawn; this was estimated to be one third of the total gold in circulation. 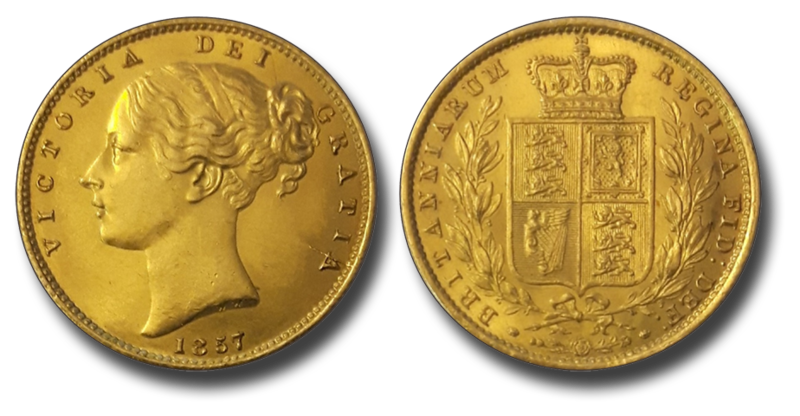 Something like £500,000 more per year of below legal limit gold continued to be taken out of circulation after 1845.” – Michael A. Marsh, The Gold Sovereign, Cambridge, 2002. 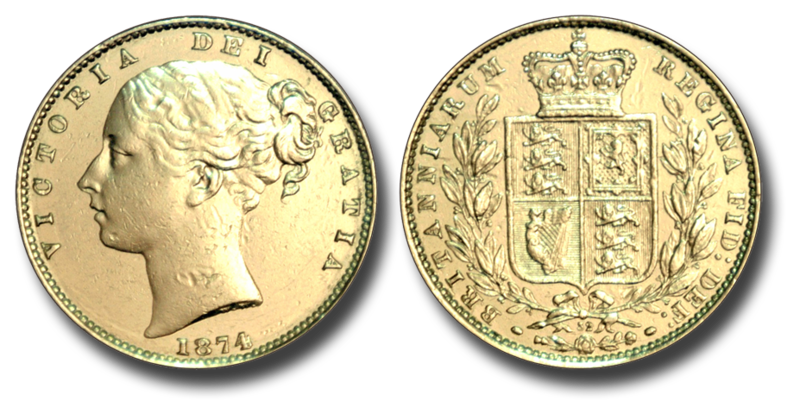 Images are copyright the author except as noted. 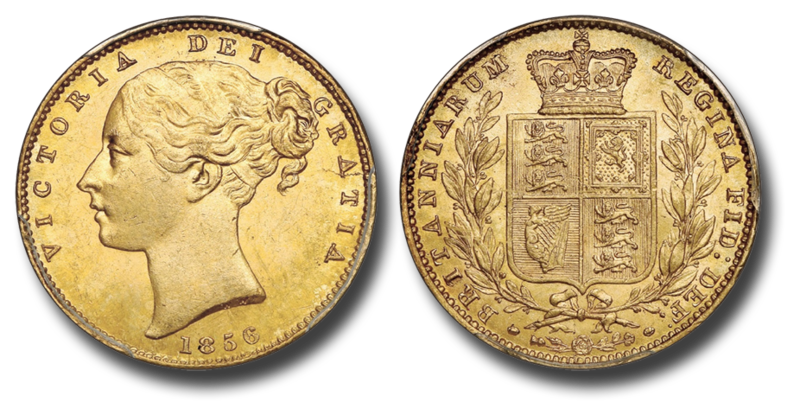 Portrait of Queen Victoria is from “Queen Victoria – Her Life in Dress” Exhibition, Kensington Palace. 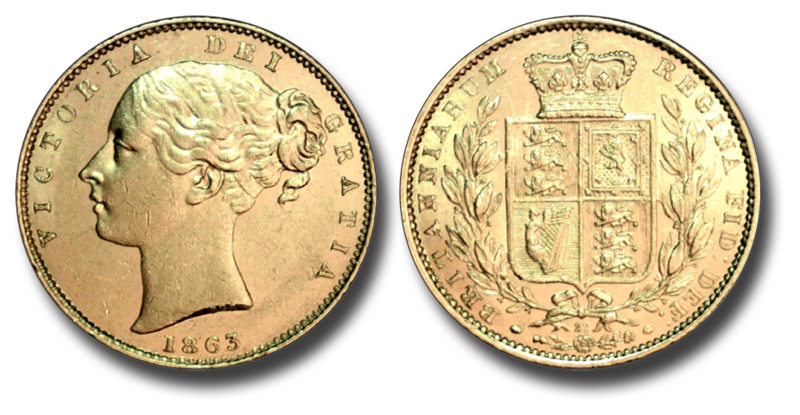 Source: http ://lamodeillustree.livejournal.com/324438.html. 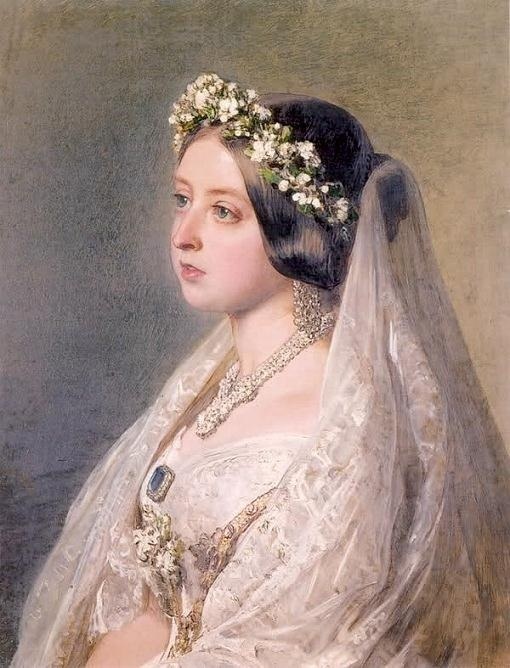 No relationship to the movie “The Young Victoria” is implied or intended. 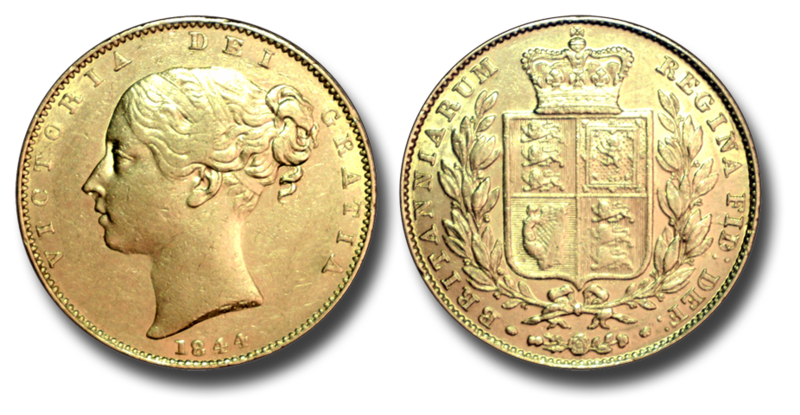 1838, 1850, 1851, 1853, 1854, 1861, and 1863 images are adapted from Heritage Auction photos. 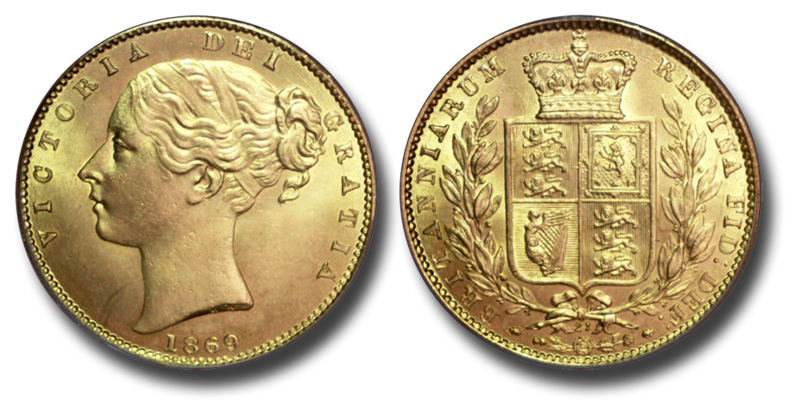 1852, 1859 “Ansell,” 1865, and 1872 (die 49) images are adapted from AH Baldwin photos. 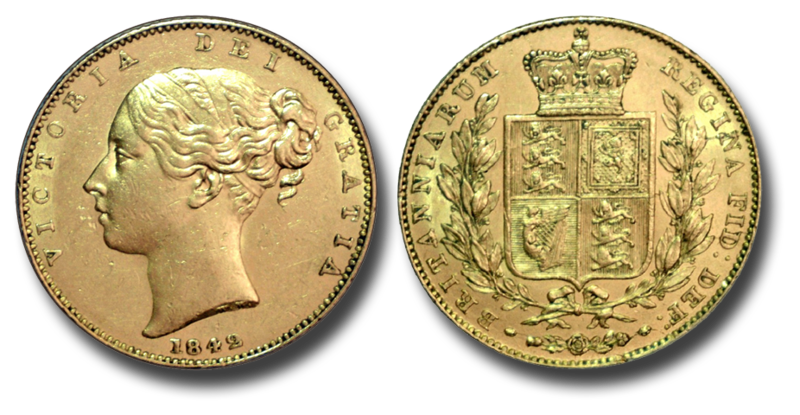 The 1856 image is adapted from a Jon Blyth Coins photo, and the 1868 image is adapted from an NGC photo. The 1864 image is adapted from a Baldwin’s of St James’ photo.